A collection of fifty-four contemporary residences, 570 Broome, draws inspiration from the history and style of West SoHo. From acclaimed architect Tahir Demircioglu, with impeccable interiors by Skidmore, Owings and Merrill, the design references the area’s industrial past via soaring ceiling heights and a silhouette evocative of staggered cubes. 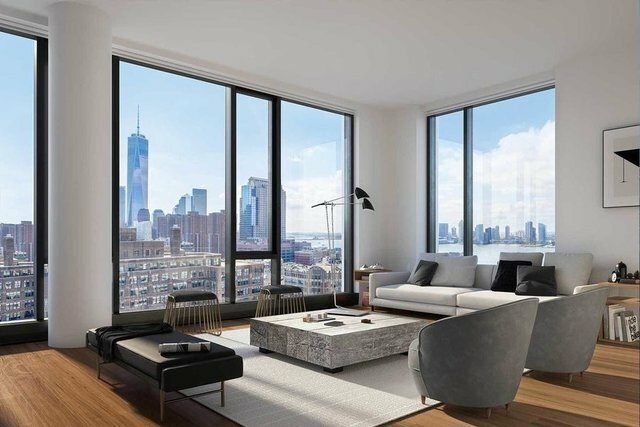 This generously-proportioned 1,138 sqft , 2 bedroom/2 bath loft-like home has a spacious south facing living room featuring floor-to-ceiling windows, open views and soaring ceiling of nearly of nearly 11ft tall. With a LR width of over 14 feet, this room is airy and light and wonderful for entertaining. The large open SOM custom designed kitchen has a Calacatta Alto marble slab countertop and backsplash and Lineadecor walnut-stained oak cabinets showcasing beautiful natural wood. The kitchen has a built-in pantry, plenty of storage and the kitchen island is perfect for additional seating. The kitchen seamlessly integrates a Miele refrigerator and dishwasher, 30" four burner Miele gas range with built in hood, convection oven and speed oven, and features Zucchetti fixtures in matte black and Elkay gourmet E-granite black undermount sink. The bedrooms have great closets with a double closet in the secondary bedroom and large walk-in closet in the master bedroom. From the master you have a charming treetop view over historic townhouses. The five-fixture master bath has a custom designed double vanity by SOM, a separate shower and tub, Alape sinks and matte black Zucchetti fixtures and accessories. Calacatta Alto marble countertop and backsplash and custom medicine cabinet with integrated lighting. The honed Calacatta Alto marble walls are cut from one slab for vein continuity and radiant heated floors are chevron-patterned Dolomiti Blanco marble. 6A also includes a full-size washer dryer & 4 pipe heating and cooling system. The complete offering terms are in an offering plan available from the Sponsor. File No. CD17-0114. Sponsor: Soho Broome Condos LLC, 136 North 10th Street, Brooklyn, NY 11249.